We’re hitting almost all the dietary excitement in one fell swoop! Not only is this gluten-free, you can easily make this Keto- AND Paleo-friendly if you wish. Mahi Mahi is a tropical, meaty, delicate fish that firms up and turns white when cooked. It cooks quickly and is often used for dishes such as this. The slaw in this recipe provides a nice, fresh crunch and fantastic flavor, and the crema adds a nice creamy lime factor which brings the dish all together. Serves 2 to 4. Directions: To make the slaw, place the cabbage, cilantro, green onions, lime juice, garlic oil and water in a food processor. Pulse a couple times to chop the ingredients into finer pieces, be careful not to process to puree the mixture, just chop. Place the mixture in a bowl and stir in the yogurt. Season with salt and set aside. For the crema, place the avocado, coconut milk, cilantro, green onion and lime juice in a food processor or blender. Process until smooth; season with salt and pepper to taste. Cover and set aside. In a small bowl mix together the paprika, cumin, onion powder, oregano and chili powder; season with salt and pepper. Rub the mixture all over both sides of each fillet of fish and set aside (you may have some spice rub left over). Heat the oil in a large nonstick or cast-iron skillet over medium-high. When oil is hot, add the fish, working in batches if necessary so as not to crowd the pan. Cook the fish on one side for 3 to 4 minutes; flip and cook another 4 minutes or until fillets are opaque (cooked through) and nicely browned. To serve, break up the pieces of fish and divide among the 4 lettuce leaves. 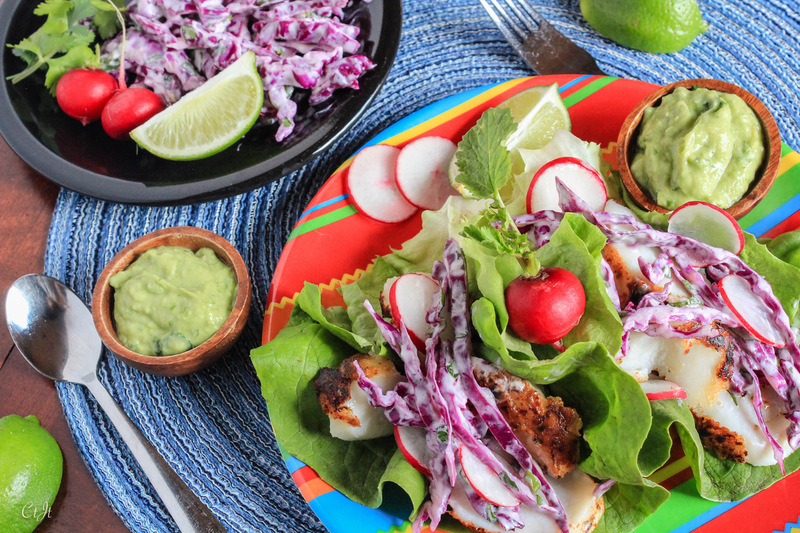 Top each lettuce cup taco with some slaw and sliced radishes. Finish by dolloping on the crema or serve it on the side with wedges of lime and your favorite keto-friendly hot sauce. Serve immediately.